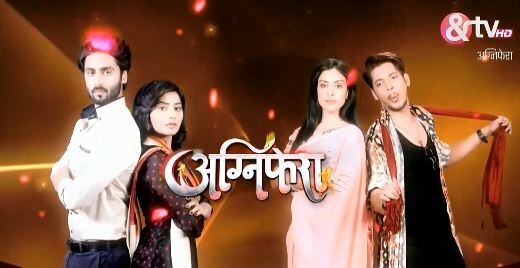 KD and Yashi promote new serial Meri Ardhangini from 21st January and brief its story. Sakshi packs her clothes and keeps her parents’ photo in her suitcase, crying. Kishan enters and asks what is she doing. She says she is going out of station for case visit. Kishan asks how can she miss his and Agni’s wedding, she will not go. Sakshi requests. Kishan says he will postphone wedding then. Sakshi says she will not go then. Kishan happily leaves. Family makes arrangements for Agni and Kishan’s wedding. Yashi holding mangalsutra says it will look very pretty on Agni. Agni reminisces Sakshi’s love for Kishan. Kishan meets her and says her sister wanted to go for case study missing their wedding, but he convinced her not to go, she is mad. Agni says she is. Kishan says he was surprised seeing her concern for him yesterday. Agni reminds him other incidents. Kishan says Sakshi goes to extreme and he is sure whoever she will love will be extreme. Agni thinks Sakshi loves him extremely and walks to Sameer’s room. Wedding rituals start. Devi calls Agni and when she does not come asks Sakshi to call her. Sakshi checks and says she is not in house. Door bell rings. Sakshi opens door and is shocked to see Agni and Sameer entering as bride and groom. Whole family are shocked to see that. Agni says she married. Kishan walks to them and laughs saying they are joking, it is a prank. Family believes him. Kishan holds Agni’s hand and says let us go to mantap. Agni stops him and says she already married Sameer. Yashi asks how can she say that. Kishan says let him speak to his Agni and asks if she does not love him. She says no, she knows he loves him and even she used to think same till Sameer enter her life, it was just infatuation, so she decided to spend rest of her life with Sameer. Hear broken Kisan asks if she is joking, he knows she loves him. Agni says again she does not love him again. Precap: Sakshi confronts Agni how can she say she does not love Kishan.